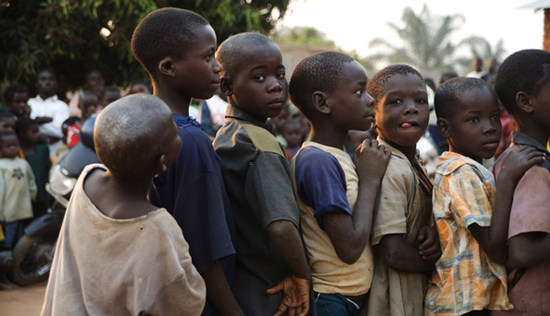 Children wait to receive measles vaccinations. Over the last few years, new vaccines to fight an increased range of childhood diseases have come to market. These new products come at a time when there is a renewed focus and international commitment to ensure that children in developing countries are also able to benefit from full protection against childhood killer diseases. But current vaccine supply and procurement practices are limiting countries’ ability to get the vaccines they want and need for their children. This is leading to vaccine shortages both at national and international level that could hamper global efforts to extend immunization to as many children as possible in developing countries. The GAVI Alliance, a private-public partnership*, finances the introduction of new and underused vaccines in some of the world’s poorest countries. Ensure a consistent and uninterrupted vaccine supply is available to meet GAVI country demands. Minimize cost of vaccines to GAVI countries. Procure appropriate, quality-assured vaccines to meet GAVI country needs. While GAVI has made some progress in meeting these objectives—notably in driving down the price of some vaccines—the following case studies illustrate that GAVI is having trouble meeting its countries’ needs—both at national and international level. In 2009, Nigeria submitted its request to GAVI for funding to introduce pentavalent** vaccine. The Nigerian Ministry of Health requested the liquid ‘presentation’ of the vaccine as most suited to implementation in the national immunization program. Nigeria forged ahead in its preparations, including reinforcing the ‘cold chain’ for keeping the vaccines cold, and adding new equipment to ensure a successful introduction of the liquid version of the vaccine it had requested. However, in late 2011, two and a half years after the country made its initial request, Nigeria was notified by GAVI that due to a shortage of the liquid presentation of the vaccine, it would have to switch plans and initially start with a lyophilized presentation, phasing in the liquid presentation as it became available. Given the far greater demands of implementing a lyophilized vaccine, requiring larger cold chain capacity, greater transport facilities and staff training, the sudden change in expectations might have thrown the country off track. In fact, Nigeria went ahead and launched the vaccine, with a view to a phased transition to the liquid version. At the time of Nigeria’s application, GAVI should have initiated forecasting of its pentavalent needs to ensure that enough global supply of the vaccine would be available. Considering Nigeria’s large birth cohort, it could have been anticipated that adjustments would be necessary to meet the country’s needs. More manufacturers should be encouraged to enter the pentavalent market. Although there are several manufacturers of the vaccine, there are only two producers that have received WHO quality assurance for Nigeria’s preferred ten dose liquid presentation. GAVI should review its vaccine introduction grants and track how many countries received their first choice of vaccine presentation. This is strong evidence as to how the global community is meeting countries’ immunization program needs. Liquid? Lyophilized? What is Vaccine "Presentation?" Vaccine presentation refers to the physical format of a vaccine product. Manufacturers produce vaccines in different ‘presentations’ or versions, including as a liquid or as a lyophilized version, in addition to pre-filled syringes, or in different dose vials. The liquid presentation takes up nearly three times less storage space than the lyophilized version. Larger volume brings other disadvantages, for instance higher requirements for temperature-controlled storage for the vaccines, or ‘cold chain,’ which considerably increases the cost of introducing the vaccine. Liquid vaccines—if in multi-dose vials—can still be used up to 28 days after the first dose is withdrawn from the vial. But the lyophilized version must be thrown away just six hours after its reconstitution. This leads to enormous amounts of wasted vaccine — on average 50 percent of reconstituted vaccines are wasted, compared to 25 percent of liquid vaccines. Liquid vaccines are much quicker to administer. Reconstituting a lyophilized vaccine takes nearly 40 percent more time to administer, meaning that fewer children will be vaccinated if vaccinators are operating within a limited amount of time. Additionally, the scope for human error is far greater when working with lyophilized vaccines. The simpler liquid vaccine minimizes the risk of contamination or handling errors. Rotavirus is the most common cause of severe diarrheal disease that is a major childhood killer in developing countries. By the time they are 18 months, eight out of ten African children will have contracted rotavirus. It’s caused by a virus that exists in a wide variety of strains or genotypes in different parts of the world, with new genotypes constantly emerging. Two new WHO quality-assured vaccines against rotavirus became available in 2007 and 2008. In 2009, following efficacy studies, WHO extended its recommendation for the vaccine to be included in national immunization programs in Africa and Asia. GAVI subsequently announced it would support the introduction of rotavirus vaccine in the world’s poorest countries. There was unprecedented demand by countries for the vaccine. 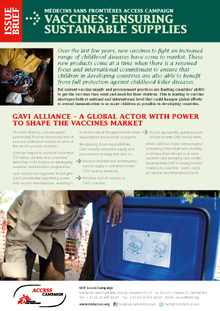 As a result, by the middle of 2012, GAVI had to acknowledge that acute shortages of the vaccine—in particular the version more suited to implementation in national programs—meant that out of 14 countries due to introduce the vaccine in 2013, only between two and five will now be able to go ahead. Countries have also been unwilling to introduce the ‘less suitable’ product, of the two currently on offer. This is also bad news for the 49 countries GAVI had hoped would introduce the vaccine by 2015—given, “no financial or supply issues” as GAVI put it. The shortages were brought about by a combination of factors: inaccurate forecasting of demand, inadequate manufacturing capacity by supplier—two companies were to provide 50 percent of the GAVI order, and only one of those provided the better suited product—and reliance on too few suppliers. Neither of the current vaccines available—Rotarix, produced by GlaxoSmithKline, and RotaTeq by Merck—are well-adapted for use in developing countries. They both share the shortcoming that they are very bulky to transport and store, and consequently take up a lot of space in cold chain storage. The RotaTeq vaccine also requires three doses to immunize a child, compared with just two doses with the Rotarix product. This not only pushes up costs but also the required number of visits a child needs to make to a clinic. Overall, countries have preferred the Rotarix product for implementation in their national programs. Even though countries are clamoring for the rotavirus vaccine, there is a broader concern about the efficacy of the existing vaccines in countries of low- and middle-income. Efficacy levels of rotavirus vaccines are put at around 30 percent lower than in the United States or Europe. Variations in efficacy are still being determined by the scientific community, and can probably be attributed to a combination of factors, among them the difference in genotypes or strains of rotavirus prevalent in different parts of the world. More research needs to be undertaken, but it could be that vaccines that have been developed against strains of the disease prevalent in Europe or the US, may understandably be less effective in many other settings where different strains prevail. MSF’s research arm, Epicentre, has carried out its own field studies into the burden and epidemiology of rotavirus disease in Niger. As well as collecting data on the age at which the disease usually strikes—and the time of year when children are most vulnerable to the disease—a study has been conducted of the main rotavirus strains or genotypes circulating in the country. Along with further information about other contributory factors, the results of the study should highlight some of the limitations of relying on the currently available rotavirus vaccines, developed first for the US and European market. Need for greater focus on vaccine supply security and procurement of suitable presentations. While the importance of GAVI’s contribution to increasing access to newer vaccines cannot be underestimated, the case studies featured here suggest that more progress needs to be made. GAVI must ensure that — as per the organization's own objectives — there is a better balance of vaccine supply with demand, the flow of vaccines to implementing countries is uninterrupted, and the vaccines delivered are the most appropriate and effective for use in national programs. Unless GAVI addresses these issues and uses its influence to better shape the vaccine market, it won’t reach its goal of immunizing an additional 250 million children by 2015 and saving four million more young lives. Insisting on adequate production capacity by suppliers as part of their contracts. Communicating results of improved forecasting to suppliers. Incentivizing new manufacturers to enter the vaccine market through supply and procurement strategies. Commissioning more research into disease epidemiology in developing countries to identify prevalent disease strains. Seeking out country expertise on product characteristics and create optimal product profile to meet country needs. Fostering more public-private partnerships in R&D to develop better products. * World Bank, WHO, civil society, pharmaceutical industry, UNICEF, developing country governments, industrialized country governments, Bill and Melinda Gates Foundation. **Diptheria, pertussis, tetanus, hepatitis B and haemophilus influenza type B. Read the issue briefs at msfaccess.org/briefings.